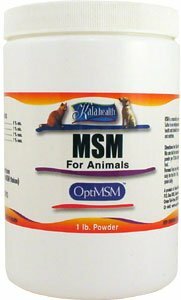 MSM is a widely recommended supplement for dogs, cats and horses to support healthy joints. It also helps support a heatlhy and shiny coat. MSM is widely recognized by veterinarians for its contribution to general animal health care. Research performed for over three decades has shown the importance of MSM as a dietary supplement. If you have any questions about this product by Kala Health, contact us by completing and submitting the form below. If you are looking for a specif part number, please include it with your message.